Drink Parody Coffee Shop "Dumb Starbucks" Opens in L.A. Parody Coffee Shop "Dumb Starbucks" Opens in L.A.
There’s a new coffee king in town, and it’s called Dumb Starbucks. The store has been giving their dumb coffee away for free, which leads us to believe that this is some kind of capitalist commentary by a rogue performance artists. 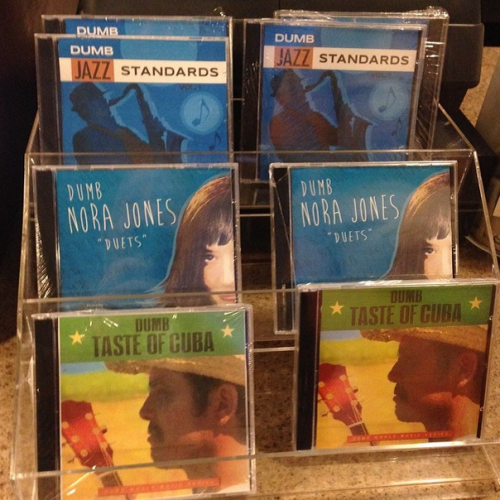 Dumb Starbucks even stocks “Dumb Norah Jones” CDs. Eater reports that, as of yesterday, there was a one-hour wait to get inside the shop. Turns out people appreciate a good corporate troll. A FAQ tweeted by Dumb Starbucks (and then promptly deleted) stated that the coffee shop is legally considered an art gallery under parody law. But it turns out that Dumb Starbucks may be in seriously iffy legal territory. Gawker spoke to an attorney who debunked the store’s logic that Dumb Starbucks is protected under parody law. Seeing that Starbucks has been quick to legally defend their trademarks in the past, we think Dumb Starbucks should call a lawyer sooner than later. Do you think this is a ridiculous art project or viral marketing stunt? Let us know in the comments.